A section of the Fort Portal-Kamwenge road. The World Bank cancelled funding for the construction of the 66km road over allegations of sexual harassment by road workers (file photo). Kampala — A Cabinet decision to borrow $40m (Shs144b) to fight sexual abuse in the country was informed by a World Bank demand for the government to safeguard women working at public infrastructure construction sites, this newspaper can reveal. Multiple sources told Daily Monitor yesterday that Ugandan bureaucrats led by Finance minister Matia Kasaija made the initial commitment a year ago during a meeting with senior WB officials in Washington DC. Other members of the delegation included Bank of Uganda Governor Tumusiime-Mutebile, Finance ministry Permanent Secretary Keith Muhakanizi, Uganda National Roads Authority executive director Allen Kagina and Mr Pius Bigirimana, the Gender ministry Permanent Secretary. 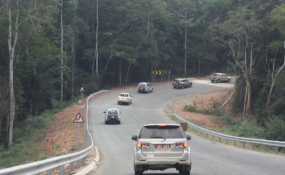 President Museveni dispatched the team after the Bretton Woods institution cancelled funding for construction of the 66-kilometre Fort Portal-Kamwenge road over, among other things, "serious allegations of road workers' sexual relations with minor girls in the community and sexual harassment of female employees". In Washington DC, the Ugandan delegation was castigated over government's failure to protect vulnerable groups and it accepted to expedite itemised reforms as a precondition for WB to unlock funding. One condition was for the Uganda government to integrate social safeguards as a key yardstick in evaluating infrastructure projects previously approved largely on the basis of internal rate of return, one official familiar with the discussions said. Ministers agreed on the Shs144b loan during a Monday meeting chaired by President Museveni, but Members of Parliament will have to give a nod before actual borrowing can happen. Mr Kasaija told colleagues that the government had no resources internally to bankroll the planned project to fight gender-based and sexual abuse. The proposal passed with "no serious scrutiny or debate", one minister said, requesting not to be named because Cabinet discussions are confidential. Another senior government official, who asked not to be named to freely discuss the matter, told this newspaper that WB officials had during the Washington DC meeting offered to support the government in capacity building and undertaking progressive reforms. It is in this context, the official said, that Kampala is turning to Washington for a social project loan this time being appraised on the basis of cost-benefit analysis. A government spokesperson told a press conference earlier yesterday that ministers unanimously approved the loan request because the "fight against gender-based violence was taken as a national priority". Colonel Shaban Bantariza, the deputy executive director at Uganda Media Centre, said: "This has become a very big issue in the country. Men have turned women into drums and very many children are being harassed. So this is a move that we need right now." Ms Peace Mutuuzo, the State Minister for Gender, however said in an interview last evening that the money is to help the government establish a one-stop centre to deal with sexual and gender-based abuse cases as well as built tailored technical capacity. "We have cases of rapes, but because of the lengthy processes of courts, victims lose hope. Others negotiate out of court...but this does not take away the fact that a crime has been committed," Ms Mutuuzo said, citing incidents at public infrastructure projects. She said they plan to put in place a mechanism to identify and equip specific hospitals, with specially-trained staff, where sexual abuse victims can quickly be referred and examined. The minister also said a shelter will be erected to keep abuse victims safe during investigations, counsellors recruited, courts built or strengthened in underserved parts of the country, police and detectives re-trained on how to gather incriminating evidence against abusers. "Every infrastructure project brings an influx of people and exerts pressure on communities. We must ensure the workers are safe and appropriately dressed in protective gears," Ms Mutuuzo said, adding that they have mooted a proposal for 30 per cent of jobs on infrastructure projects to be ring-fenced for women. Bureaucrats did not immediately provide statistics on how widespread the problem of sexual and gender-based violence is to topple other unfunded priorities such as Nodding Syndrome or procurement and installation of Closed-Circuit Television (CCTV) cameras that the country requires to tackle rising sophisticated crime. Mr Muhakanizi said they evaluate funding prioritisation based on urgency of the purpose and impact on the whole country as well as available resources. "At our work places, bosses are abusing the women and young boys the way they want," he said, adding: "So, do you still think it (Shs144b loan request) is [not] a priority? We need to empower the society and grow it holistically." Uganda's current debt portfolio stands at Shs37.9 trillion, according to Bank of Uganda figures for the period ending December 2017, higher than the national budget. The Gender ministry is the end user of the Shs144b. Mr Bigirimana yesterday named 14 districts where the planned project is to be piloted. They are Kabale, Kabarole, Kamwenge, Kisoro, Hoima in western Uganda; Wakiso, Masaka and Mukono in central region; Zombo, Apac and Aleptong in greater north; and, Mbale, Sironko and Kamuli in eastern Uganda. "The districts were selected through vigorous scrutiny by the ministry (Gender) and the ministry of Health. We looked at the areas with most cases of gender based violence, presence of intervention measures and population of the districts at higher risk of facing the vices," Mr Bigirimana said.